A Hawkeye offensive lineman reveals his toughest opponent. PHOTO COURTESY: BRIAN RAY/HAWKEYESPORTS.COM To read Welsh's op-ed piece and watch clips from his press conference, visit bit.ly/WelshSean. 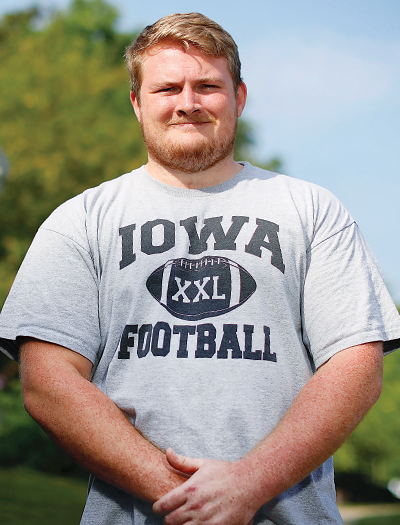 Sean Welsh spends Iowa game days in a fierce clash—trying to overpower some of the nation’s top defensive linemen in front of thousands of screaming fans. Still, the physically and emotionally taxing battle on the gridiron doesn’t compare to the hidden challenge the fifth-year UI senior faces every day: depression. Welsh, a three-year letterman and 2017 Sports Illustrated preseason all-America second team selection, revealed his internal adversary this past summer through a speech to his teammates, a press conference, and an op-ed piece on hawkeyesports.com, which appeared in numerous newspapers and gained traction on social media. Welsh chose to share his story publicly while he has a platform to encourage others to speak up and seek the help they need. "Success doesn't immunize you from depression," says Welsh, whose struggle emerged in summer 2014 as a redshirt freshman. Weighed down by sadness, anxiety, and anger, Welsh isolated himself from teammates, slept more, and ate less. "It was every dimension of terrible," he says. "And I kept wondering what was wrong." Welsh stopped initial therapy sessions once the 2014 football season started, but the symptoms reemerged when he returned from winter break. The Springboro, Ohio, native left campus in spring 2015 to tackle his issues and was diagnosed with depression. Medication helped him through the season, and though his difficulties resurfaced, Welsh has since adapted his lifestyle to manage his symptoms. He says, "I've learned that I need a routine, I need to stay busy, and I need to be around people." Welsh's teammates and coaches have fully supported him as he fights depression—an issue that affects nearly a quarter of college athletes, according to the British Journal of Sports Medicine. "It's so commendable what he's done—to watch him take this challenge straight on over the last couple years," says head coach Kirk Ferentz. "You think you know somebody, but you never know what's going on in someone's mind." Welsh, a communications major, expects to graduate next month, and this time he'll leave campus on his own terms. " This isn't how it's going to be forever," Welsh shared in his press conference. "Just know that when you're in the thick of it—it's kind of a battle between your emotions and logic."